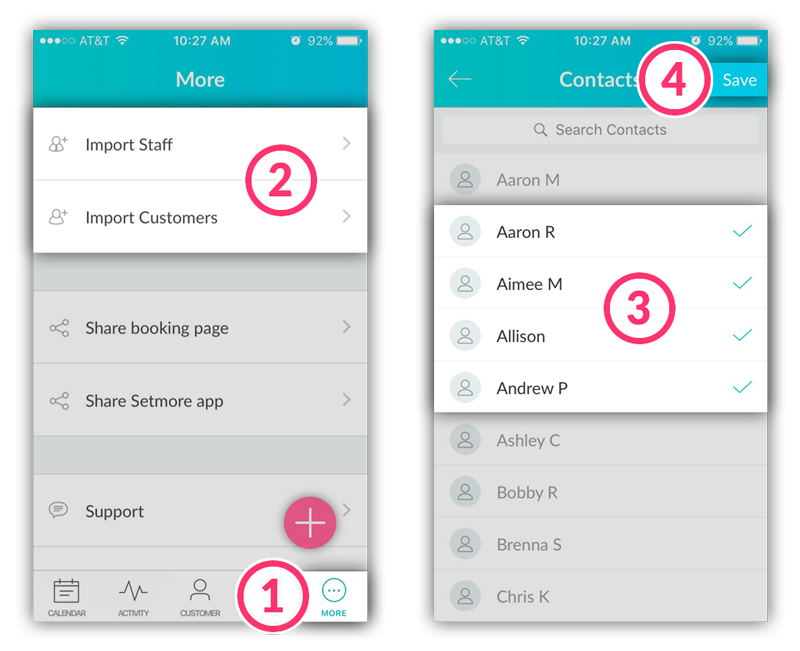 You can import customer/staff information from your phone contacts into your Setmore account. This time-saving feature helps transfer details such as the customer or staff’s name, email address and phone number. In the More menu, tap either Import Staff or Import Customers. At this point you may be prompted to allow Setmore to access your phone contacts. Tap to select the contacts you want to import – a checkmark will appear to the names you have selected. When everything looks good, tap Save in the top-right corner. Your contacts will be imported. If importing contacts as new Staff members... Once you import contacts, be sure to set up the new staff member’s working hours, services, and upload a picture. You’ll need to take these final steps before new staff members can take appointments. Click here for more information on managing your staff profile.